Our Dog’s Corner has 3 sections: (1) Puppy Healthcare, (2) Adult Healthcare and (3) Celebrate Seniors. Please browse through these sections to read about all the routine health care needs of your dog but if you have any queries or comments do not hesitate to contact us. We combine high standards of small animal veterinary practice with a commitment to all-round patient care. Our clinics are equipped with clinical and surgical facilities. A full range of diagnostic techniques are available in-house. We have a range of pet items on sale including foods, flea and worming products. Even the healthiest pet needs to visit the Vet from time to time. To keep your pet in the best of health we recommend regular vaccination and flea/worm treatment, as well as early neutering and microchipping – and pets need regular dental care just as we do. Of course, if your pet should become unwell or be involved in an accident we have regular consultations by appointment plus 24hr emergency cover. We aim to provide up-to-date, caring attention for pets and prompt, reliable service for their owners. Mulcair Vet Clinic, Cappamore, Co Limerick. 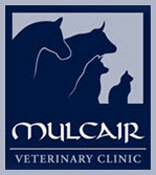 Mulcair Vet Clinic, Newport, Co Tipperary.